Popular yoga instructor Julie Schoen’s new book, Flat Tummy Yoga, arms readers with everything needed to sculpt and flatten the midsection. Part of Little Pearl Publishing’s Just Do Yoga series, Schoen’s latest book will be free during January 23, 2013 exclusively on Amazon. Brand new book arms readers with everything needed to sculpt and flatten the midsection with nothing more than a yoga mat. When asked which part of their body most women would like to improve on a recent internet survey, an overwhelming percentage agreed that their tummies are their biggest concern when it comes to their appearance. Ladies, line up. Popular yoga instructor Julie Schoen’s brand new book, Flat Tummy Yoga, arms readers with everything needed to sculpt and flatten the midsection with nothing more than a yoga mat. Part of Little Pearl Publishing’s Just Do Yoga series, Schoen’s latest book will be free during January 23, 2013 exclusively on Amazon. Looking at her, one would never guess that Schoen is the mother to a bouncing baby boy. In a short five months, Schoen has once again reclaimed her tummy, showing off a six-pack that everyone, let alone someone who just had a baby, would be envious of. As promised, Flat Tummy Yoga does just that, providing the reader with Schoen’s personal yoga routines, each geared towards specifically targeting the tummy. The book also offers sound advice for why sit-ups aren’t the way to get a model-esque stomach and some of the best exercises to do every day to ensure a toned body come bikini season. 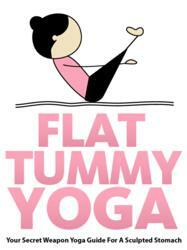 Flat Tummy Yoga will only be free January 23, 2013, so don’t forget to head over to Amazon now to check it out!